Let me tell you a story about a man named Jonathon Rodriguez. Jonathon's a pretty smart guy; he was savvy enough to invest in the New Order. But something was missing. Jonathon had only 7 shares to his name. Better than nothing, sure, but he wanted more. So Jonathon decided to upgrade his life by purchasing 400 additional shares. 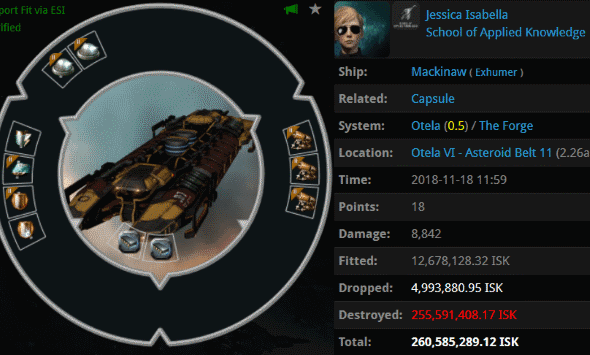 Jonathon's life upgrade took us past the 1,620 billion isk mark and earned him a Supreme Protector's Tip of the Hat™. Things are looking up for Jonathon. 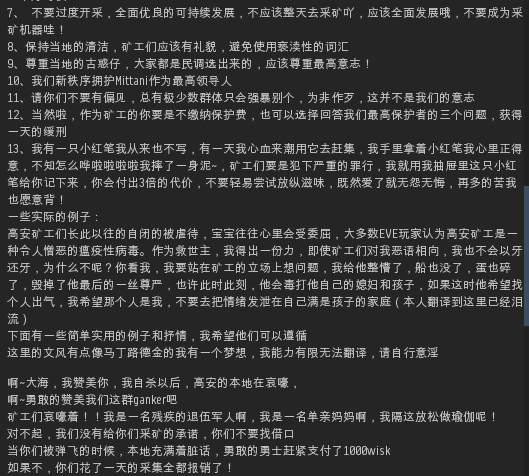 Although the Code has already been translated into Chinese, Jessica was dissatisfied with the translation. She decided to create her own version. Translating a document as important as the Code is a challenge. The translator hopes to use the new language in creative ways to capture the flavor of the text being translated, but he must also take great pains to remain faithful to the original. In Jessica's case, she took some liberties and inserted her own parenthetical asides. Needless to say, Jessica did not always demonstrate sufficient respect to the magnificent document she was translating. 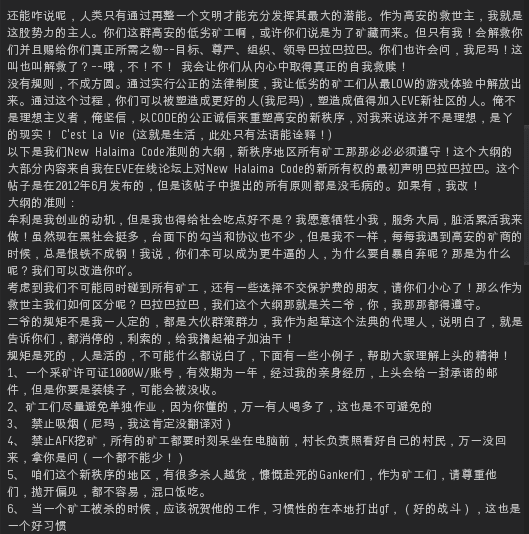 Nevertheless, those who read Chinese are invited to take a look at Jessica's translation and compare it to the Chinese translation already available. 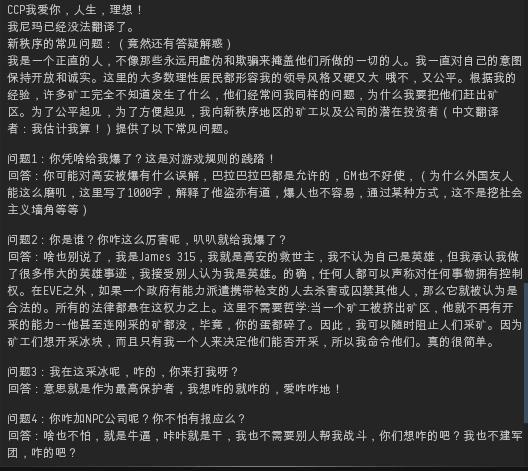 For those who cannot read Chinese, here's a Pastebin of Jessica's translation so you can run it through the text translator of your choice. The eagle-eyed reader might wonder how the translation was produced so quickly after the gank. 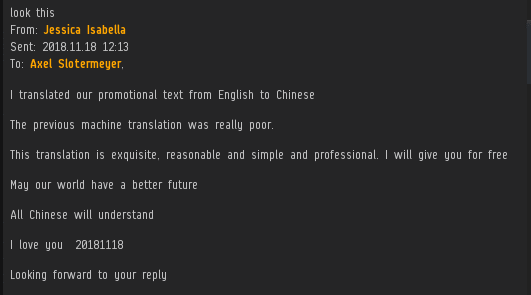 Well, it seems that Agent karma balancer ganked one of Jessica's alts a few days earlier, inspiring the translation--which was posted to a Chinese message board. For those in china who want to learn how to gank unlicensed chinese miners, or purchase premium quality baby formula direct pm me in game. 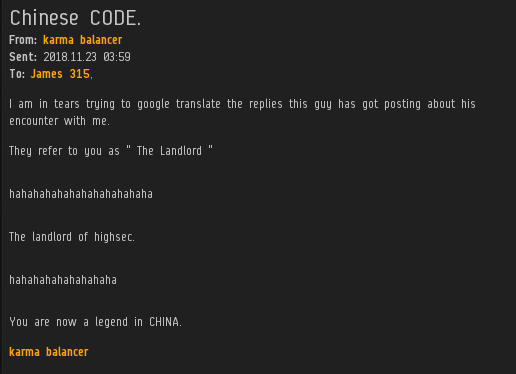 Praise be upon James 315, our Glorious Landlord of Hisec!